With Philips' new monitor, we'll never have to argue over whether the dress is blue or gold again. That's because this stunning 27-inch Quad HD display covers the full spectrum of workable colors with near-perfect accuracy. The Brilliance 272P4APJKEB is certified to cover 100% of the sRGB color gamut, which was designed by HP and Microsoft to measure and determine the working colors that are able to display on televisions and monitors. The Brilliance falls just short of color perfection on the Adobe RGB test, covering only 99% of the gamut. 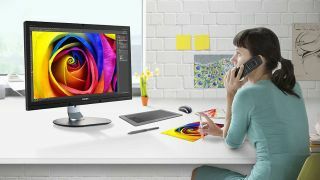 This makes the monitor ideal for creative professionals who need color output to be consistent across all working devices. Photographers, videographers, graphic designers and anyone who geeks out of image quality will love this display. The Brilliance is capable of displaying 1.074 billion colors with a contrast ratio of 50 million-to-1. It includes DisplayPort, HDMI, and Dual-link DVI connectivity, in addition to three USB inputs and one USB output. You can connect multiple sources to the display, in case you want to play a little FIFA 16 while you listen in on a video call. However, the monitor's 5 millisecond response time isn't ideal for gaming, so I suggest you check out the other amazing monitors we've reviewed, some of which feature 1 millisecond response times. The Brilliance is available in the US for $899, which is pretty steep for a non-4K monitor. For example: you can purchase the Acer S277HK for $539. The Acer also covers 100% of the sRGB gamut, but it features a 4 millisecond response time, a 100 million-to-1 contrast ratio and it's 4K. What is the best monitor in the world?